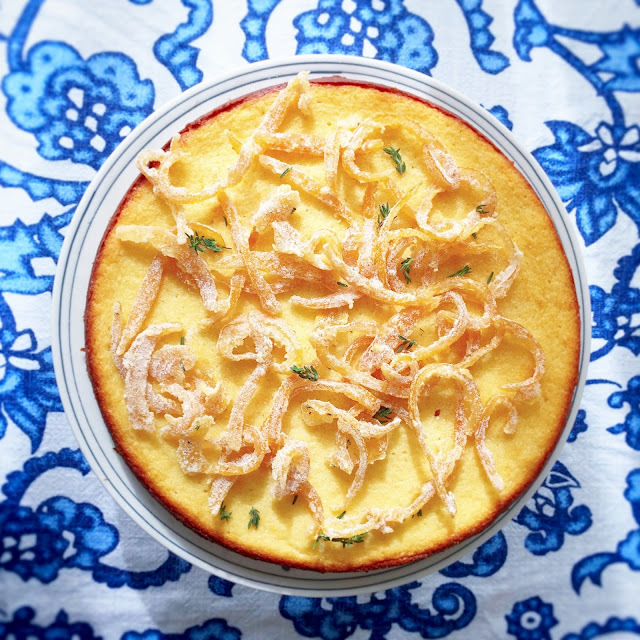 This little recipe is perfect for lunch. It's simple, it's very light, it's as healthy as can be, and it's satisfying. Let's break that down, shall we? Simple: Mix batter. Make crepe. Fill. Roll up. Eat. Perhaps the hardest part about this recipe is making the crepe. I don't know about you, but the first crepe, much like the first pancake, is always a little wonky. But once you get the pan to just the right temperature, all of your crepes will turn out beautifully with that satisfying little crinkle at the edges. But I get ahead of myself. 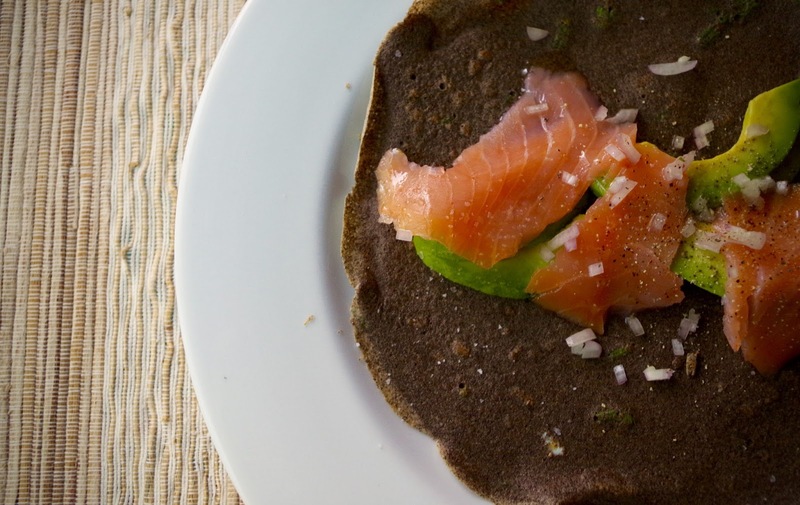 Very light: Yes, buckwheat can be a bit assertive, but thinly spread out into a crepe and topped with smoked fish, well any buckwheat crepe is going to back down a little and let the innards shine. 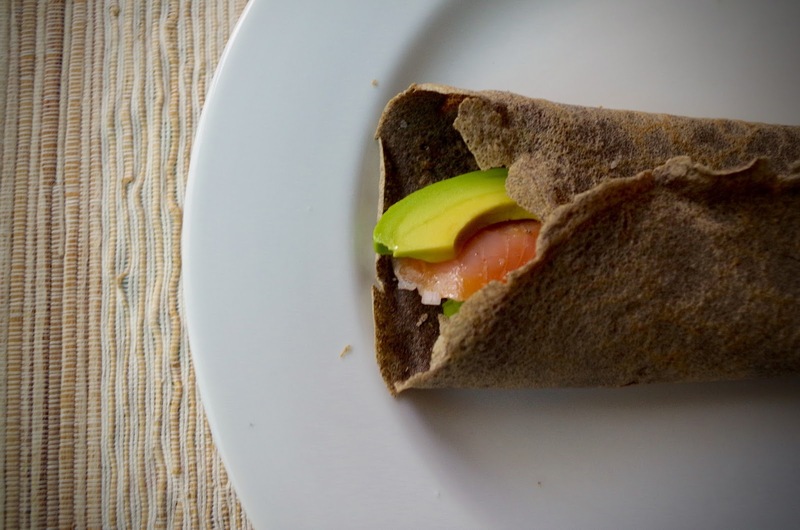 And while there is an abundance of fat in this crepe, said fat leads both to the healthy and the satisfying. Again, I am getting ahead of myself. Healthy as can be: Friends, it's buckwheat (champion of lower cholesterol and blood pressure, hero of fiber, calcium, and lignans), salmon (aquatic vertebrate with oodles of omega-3 fatty acids, selenium, bioactive protein molecules), and avocado (purportedly the only fruit that provides a substantial amount of healthy monounsaturated fatty acids and another fruit that boasts plenty of potassium). I repeat: Buckwheat! Salmon! Avocado! 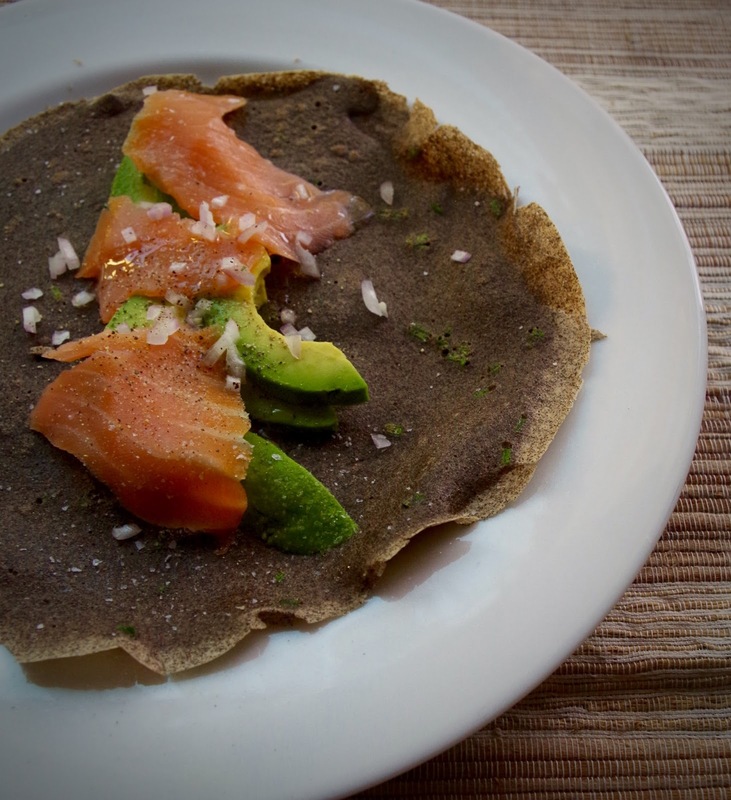 Perhaps the only thing that could make this healthier is if this little crepe could floss your teeth. Satisfying: Okay, we have already established the satisfying crinkle at the edge. 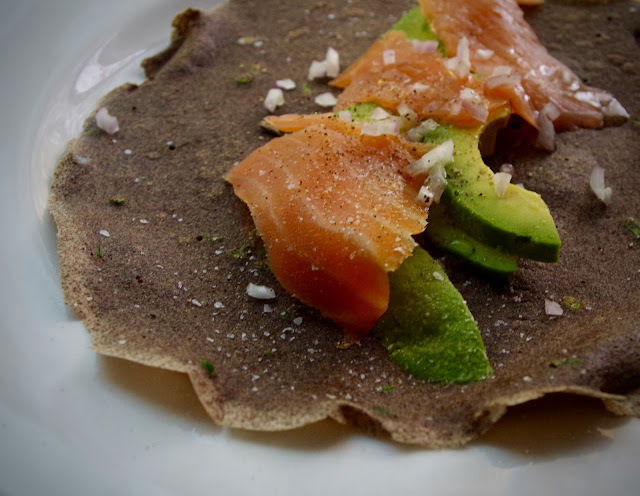 However, let's hear it for avocados and smoked salmon. Avocados are just so rich. You never need a lot (but I will admit to occasionally eating halves of them with just some salt and a spoon). And I love smoked fish. It gives you all the umami flavors that our palates crave and the protein your belly needs to feel full. If anything, I would add a sprinkling of capers. However, that's because I am a little predictable and love smoked salmon with its usual standby of cream cheese and capers. But next time I make these, and there will be a next time, I am just going to give into that tug of indulgence. Otherwise, don't change a thing. Not. One. Thing. 1. Mix the flour and salt in a large mixing bow. In a separate bowl, whisk together the milk, eggs, and chives. Pour into the flour and stir until the well combined and lump-free. Let sit for 5 minutes, then sir again, and thin the mixture by adding water (a splash or a tablespoon at a time) until the the batter has the consistency of heavy cream. 2. Heat a large nonstick skillet over medium heat. Melt a little coconut oil or heat olive oil in the skillet. Then pour in 1/4 cup batter to thinly coat the bottom, rotating the pan as you pour so that the batter spreads across the entire pan. Cook until golden and the edges of the crepe are beginning to curl and lift. Flip and then cook the second side. 3. Transfer to a plate (cover with a clean dish towel) and cook the remaining batter the same way. 4. Halve, pit, peel, and thinly slice the avocados. Arrange some salmon and avocado in the center of each crepe. Squeeze some lemon, drizzle some olive oil, add some salt and pepper, and, if you're in the mood, a sprinkling of capers. Roll up and enjoy.